Throughout November, we’ve been bringing you stories about mental health on In The Wings. So far we’ve discussed addiction, post traumatic stress disorder and paranoid schizophrenia — all through personal storytelling. And this week, we’re introducing you to two sisters who are using that same approach — personal stories — to talk about depression. 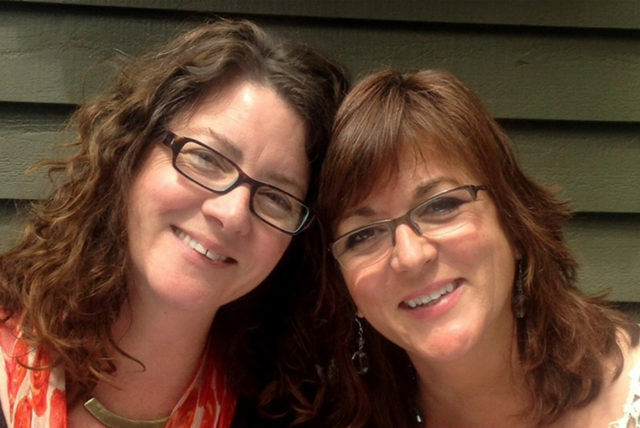 Sisters Bridget (left) and Terry White, co-hosts of Giving Voice to Depression Podcast. Terry White is a former TV news reporter and anchor, and she has worked as a voice talent since leaving the local news business. Her sister, Bridget, is a massage therapist based in Washington state, and they are both certified in Mental Health First Aid. While they are not counselors or mental health professionals, they have a personal connection to the disease. They both have depression, and they’re not ashamed to talk about it. Tapping into her media background, White launched an online podcast earlier this year called Giving Voice to Depression, co-hosted by her sister. Instead of formal training, they share their firsthand experiences living with depression. Their own struggles, White says, gives them valuable insight into the disease and allows them to connect with others dealing with it. They produce at least one episode weekly, bringing in a variety of guests — both everyday people and professionals — to discuss various aspects of depression. Each episode features a personal story, showing the human side of the illness, White says. In its eight month run, the sister duo has produced about 40 short-form podcasts, and racked up thousands of listeners and streaming sessions. And recently, the podcast received funding from the Charles E. Kubly Foundation allowing them to produce another season. The podcast is connected to White’s nonprofit, Giving Voice to Mental Illness. Eventually the sisters hope to expand the podcast to cover more mental health topics like anxiety and bipolar disorder. Click the player below to hear our interview with White. You can listen to the podcasts on most popular platforms, including iTunes, Stitcher, Soundcloud, iHeartRadio and more. For more stories about mental health, click the tiles below.